Were you a fan of the show before you joined? Of course I was aware of the show and its popularity, but I confess I hadn’t watched it. I don’t get a lot of time for regular TV watching when I am working. How does it feel to be part of the cast? I have been spending a lot of time in all-female Shakespeare plays and feel very easy with a lot of women so this cast felt like a continuation. A great band of women, very bonded and very welcoming and also surprising, funny and politically opinionated in a way their on-screen characters wouldn’t hint at. Tell us about the character you play. 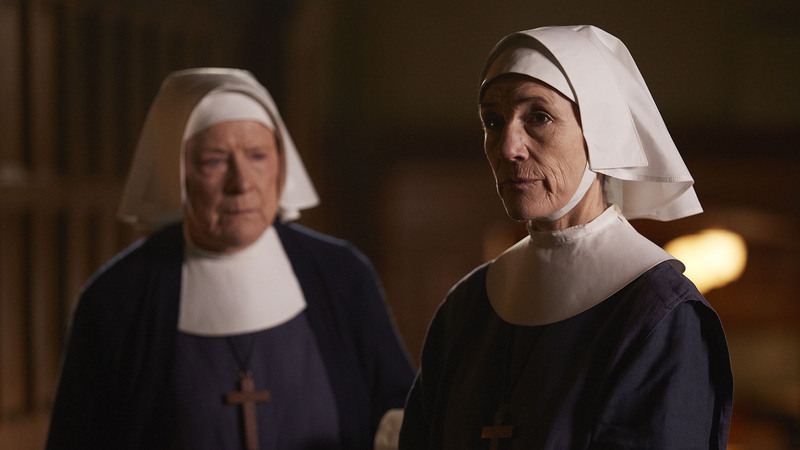 Sister Ursula is an unpopular new broom sent in by the Mother House to sweep away what is seen as a rather laissez faire soft attitude that has taken root under Sister Julienne. We find out over time, that there is a little more of a personal crusade at the heart of her toughness. No character is all bad, that would be boring to play. Heidi and the producers were happy to work with me to give a somewhat redeeming glimmer. What is it like to wear the wimple? Well I felt “we are all in this together”. This isn’t a glamour show, it is one that focuses on people and character. In a way, the plainness forced on us helps make for an honest no-frills style of acting. Why do you think the show is so popular? I think the best thing about it is that it gives us a bit of a social history lesson and tackles quite gritty issues but in a warm and light way. People love to get to know individual characters over several years and see the shifts in balance and allegiances and I think it is great to see so many very different female characters in one drama. I think it has the nostalgia ingredient also, in these pretty complicated times it is good to be reminded that most people are decent and want to be decent.